The Meeting Place on Olive is a professional and accessible conference room for your off-site meeting. Ensuring privacy and security, our conference room is the ideal place to meet with colleagues or clients. This flexible layout allows for a 12-seat boardroom setup or up to 20 people in a presentation-style layout. The conference room presents a professional atmosphere and includes a long table and plenty of chairs to accommodate all of your clients and colleagues. Members enjoy having a convenient off-site conference room. 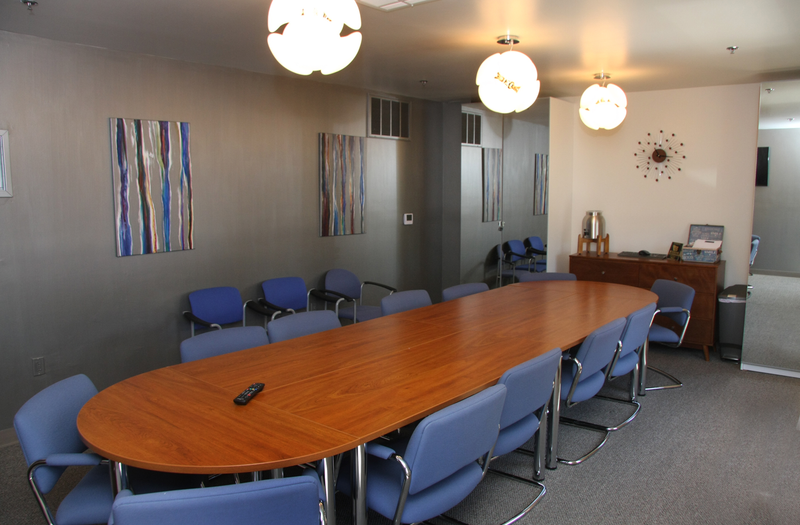 Located in Downtown Burbank, this conference room is conveniently located near many restaurants and public transport options. Invite your clients or colleagues out for your off-site meeting where you can converse, collaborate, and negotiate in our comfortable and convenient meeting space. My Other Office provides a professional setting perfect for any type of meeting. Perfect for training sessions, presentations, or office retreats, our spacious conference room is equipped with services and amenities that feature the latest technology. The conference room layout can also be transformed into whatever professional setting you desire. We have video conferencing, teleconferencing, projection/presentation screen, boardroom or classroom setup. We provide our members with everything they need to ensure that their meeting and/or presentation is a success. We include secure WiFi and teleconferencing capabilities to allow you to communicate with clients or colleagues across the globe. We can even arrange for multi-day events, catered meals, and small group discussions so you can ensure that your clients and colleagues stay productive. Our conference room is available by the hour or the day (3 hour minimum). Our flexible packages allow you to book a room for however long you need it. Whether you need the room for a few hours or want it for the whole day, we can find a package that fits your needs. Call us today to reserve your spot!